Priya and Vishaal shared a magical day with their friends and family. Their day-long celebration was filled with lots of red, gold and love. Priya’s flawless day began with popping a bottle of champagne with all of her bridesmaids when they were getting ready for the ceremony. Priya’s loved ones helped deck her in red and gold attire and she held a large white bouquet that accented her dress perfectly. Priya elegantly floated down the aisle that was traced with white fabric that flowed from above. 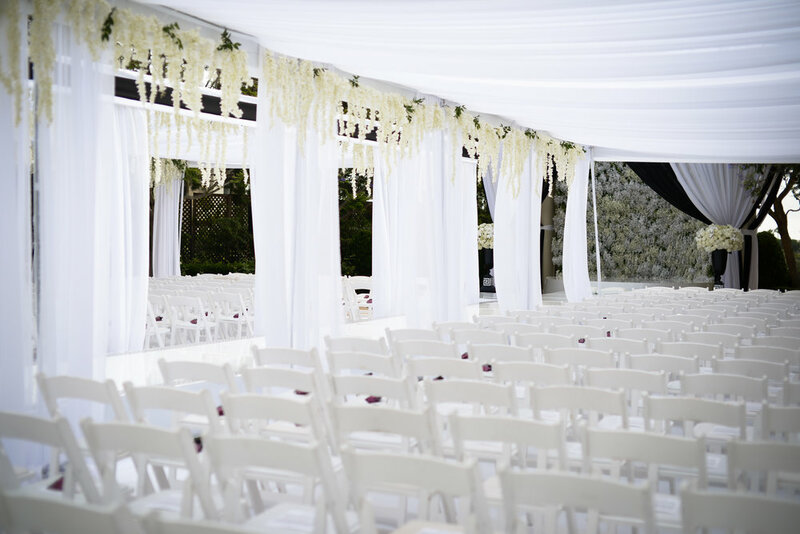 The green space of the Monarch Beach Resort was transformed into a magical, unrecognizable wedding location that took our break away. We were so happy that we got to share in Priya and Vishaal’s special day and give them their dream wedding. Focal points of Priya and Vishaal’s immaculate wedding were the grand archway that guests sat beneath and the floral wall that was over-the-top and the provided the perfect accent piece for the overall design of the celebration. Tabletop arrangements effortlessly detailed the reception tables and above the dance floor hung decorations of black and white. More Stunning Real Weddings Of Ours!